The U.S. is "totally prepared" for "devastating" military action against North Korea should that be necessary, President Donald Trump declared Tuesday, further ratcheting up tensions between the two nations. 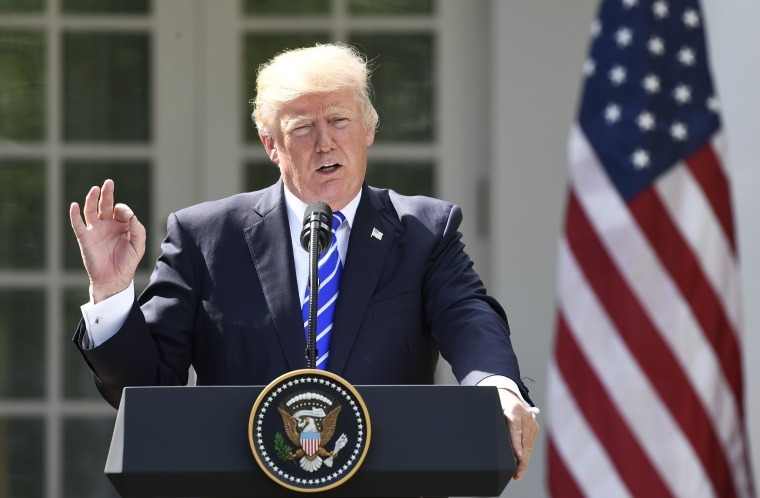 "If we take that option, it will be devastating," Trump said during a joint press conference from the White House Rose Garden with Spanish Prime Minister Mariano Rajoy. "That’s called the military option; if we have to take it we will," the president said, adding that while it was not the preferred course, the U.S. was nonetheless "totally prepared for it." Trump said the time had come for the world "to isolate the North Korean menace" and dictator Kim Jong Un for "behaving very badly" and "saying things that should never ever be said." He also slammed Kim's "outlaw regime," charged "all nations" to "act now to ensure the regime's" denuclearization, and claimed he'd been left a "mess" on the Korean Peninsula by prior U.S. administrations. "But I'll fix the mess," Trump said. Trump’s remarks come after days of intensifying rhetoric between the U.S. and Pyongyang over North Korea's nuclear provocations. One day earlier, North Korea's foreign minister said Trump had "declared war" on his country and that Kim's regime would consider shooting down American bombers. Foreign Minister Ri Yong Ho told reporters in New York on Monday that "Trump claimed that our leadership wouldn't be around much longer and he declared a war on our country. Even the fact that this comes from someone who is currently holding the seat of the U.S. presidency is clearly a declaration of war." The White House in turn, rejected the notion it had declared war, and ripped North Korea's talk of shooting down American planes as "absurd." "We have not declared war on North Korea and, frankly, the suggestion of that is absurd," White House Press Secretary Sarah Huckabee Sanders said at a press briefing Monday.